And one of them won't be sold separately. Bandai Namco will host an open beta for Gundam Versus ahead of its release in the Americas, the publisher announced at its San Diego Comic-Con 2017 fighting games panel. Exact dates for the beta are still to be announced. 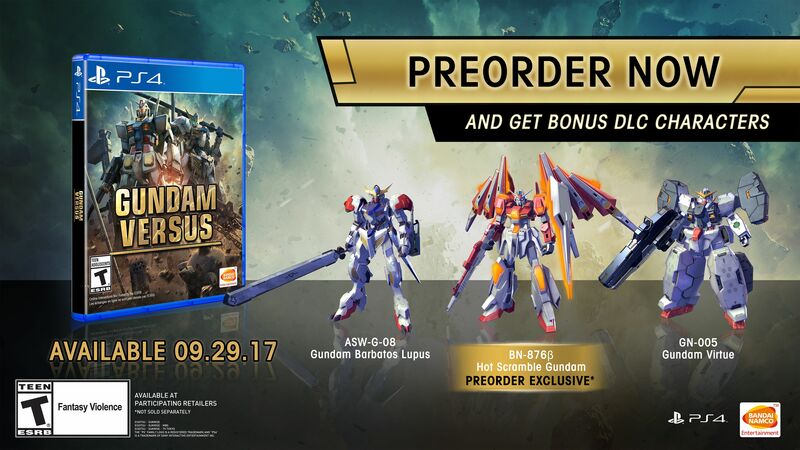 The company also announced that pre-orders for Gundam Versus in the Americas will include bonus downloadable Mobile Suits “ASW-G-08 Gundam Barbatos Lupus,” “GN-005 Gundam Virtue,” and “BN-876 Beta Hot Scramble Gundam.” The lattermost Mobile Suit is pre-order-exclusive and will not be sold separately.